He told the BBC he was being "victimised" and the uncertainty was causing stress to his students. The vote of no confidence was passed on 27 March which accused Mr Di Felice of "continued mismanagement and general incompetence". Dr Humber said: "On the Wednesday the branch passed a motion of no confidence, on the Thursday I circulated that in my role as membership secretary, and on the Friday I was suspended with completely spurious reasons. "I'd invite people to draw their own conclusions." He added: "I was accused of missing three meetings with the assistant principal... which is just not true. I couldn't attend these meetings because I was working." 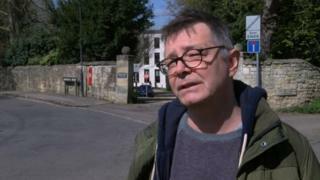 The college said it did not "discuss internal staff disciplinary matters" but insisted there was "no connection between the suspension of Lee Humber and his work as a trade union officer or to the recent vote of no confidence". It added: "It is inconceivable that Ruskin, of all places, would do anything to undermine the work of our trade unions - solidarity with the labour movement is in the very DNA of the college." It also said it had a "zero tolerance approach to misogyny, bullying, intimidation and harassment", but Dr Humber said he did not have the "foggiest" what this meant. A spokesman for the University and College Union, which represents academic staff, said: "The absence of any meaningful reason from the college suggests to us that it must be down to his trade union activities and the no confidence vote in the principal." He called on the college to "immediately reinstate" Dr Humber.